God's Word spoke to my worries again this week, in a big enough way that I'm willing to type with just my thumbs to tell you about it! No internet today, bugger's been giving me problems all month! No internet, but I do have shiny new phone that let's me blog on the go! Might be dangerous though....for a couple reasons..... 1. The phone has a very robust spell correct, and when you're typing on a touch screen, anything can happen. It keeps trying to change "God's" to "fiscal"....hmmm...I could go somewhere with that contrast... 2. Multitasking to this level could be dangerous.....that's how my previous phone got dropped in the sink! That's why I'm reduced to thumb typing today! So, first the worries....just this past week I blubbered to my table group at church about how I'm already starting to worry about the forms and cash part of this adoption experience being over. I know it's a long way off....but I'm realizing I like it here. I really like being in the middle of an impossible situation that I'm certain God has called me to. It's rush to watch God work up close like this, it's so good for my heart. I don't ever want to go back to comfortable-land, everything is bland there....I know, I built a summer home there...I'm afraid I'll move back in and take the sheets off the furniture if I don't have another itinerary planned. It may be bland there, but there's a creepy, magnetic pull about the place. 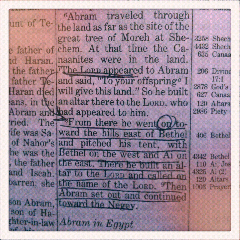 So Abram's experience in Genesis 12 really got my attention. You probably know the story....God called him to leave everything comfortable and start traveling. So Abram left, as the Lord had told him. And then he stops, sets up camp and THE LORD APPEARS TO HIM! He worshipped, built an altar, and probably told everyone about it. I bet he was so in awe of God that he would have blogged about it if he had a phone like mine! But the grabber for me comes in verse 8. Abram kept moving! How do you walk away from the place God appeared to you? Everything in me would want to stay right there, reliving the memories! Maybe that would make sense if God wasn't alive. But Abram knew God, so he set up camp in a new place, built another altar and called on the name of the Lord again. Instead of worshipping the experience of hearing God speak, Abram worshipped the God who speaks. Abram was confident God would speak again, that's why he kept walking and worshipping, expecting God to appear again. I've got an itinerary planned, and it doesn't involve a stop at comfortable-land....I'm planning to keep moving today...and tomorrow...and tomorrow. Wanna come build some altars with me and find the next place God's gonna appear?? Hey, friend! We missed seeing you today though it was good to see another friend too. What a huge blessing to me that our study is speaking to you! Makes me tear up! I CAN'T WAIT to chat with you about how God is talking to you. Thanks for posting!